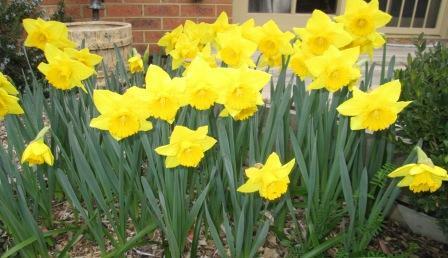 As Spring draws to a close, I fondly remember the daffodils which heralded the arrival of the season. I have oft-repeated my love of bulbs, for their tenacity and continuous consistency, so let’s revisit a host of golden daffodils. 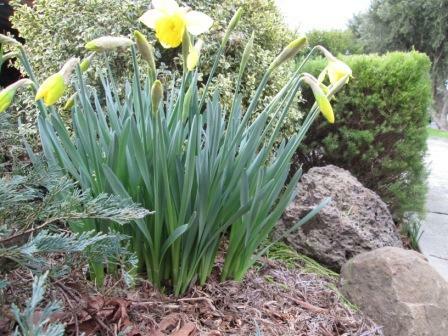 One year I splurged and bought some designer daffodil bulbs, shown below. 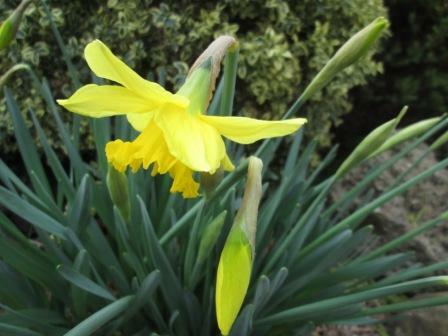 Enjoy one last look at a daffodil, because before we know it, Christmas will be upon us! 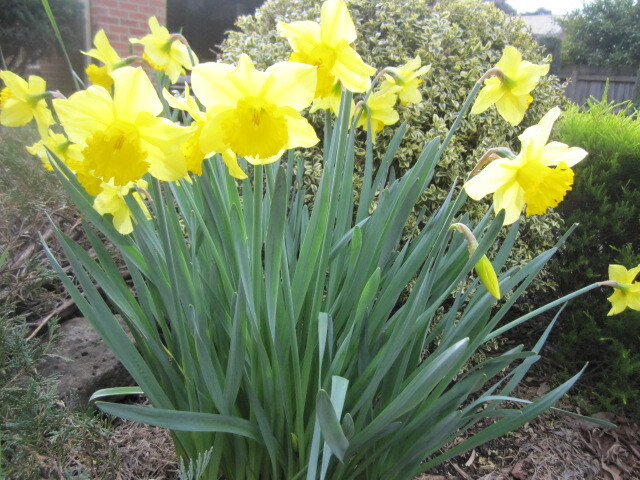 Daffodils have always reminded me of my dear departed Dad, as he was very fond of bulbs. I think part of this stemmed from his Scottish heritage (my maiden name is Reid), as it is a very cost-effective way of having flowers, particularly compared with annuals. Not only do they come up every year, but they multiply, and that is very thrifty! I, too, carry this gene, and you can see it often in my recycling ways, saving money and being a creative outlet as well. Last year I wrote about a family tradition, whereby Dad would always cut the first daffodils and place them in the blue vase on the mantelpiece. I inherited that vase, and have emulated that habit, except for last year when I couldn’t find the vase. At least I had photos of it so I didn’t mind too much, and blogging about it seemed to satisfy the urge to continue the tradition. 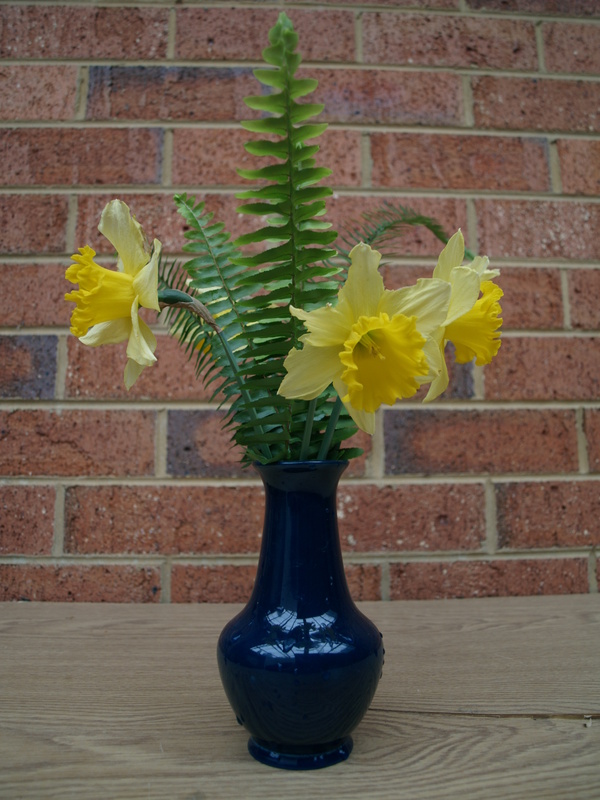 To my delight, while my husband and I were cleaning out and re-organising the garage earlier this year, I found the vase, so the daffodil tradition has been happily reinstated. 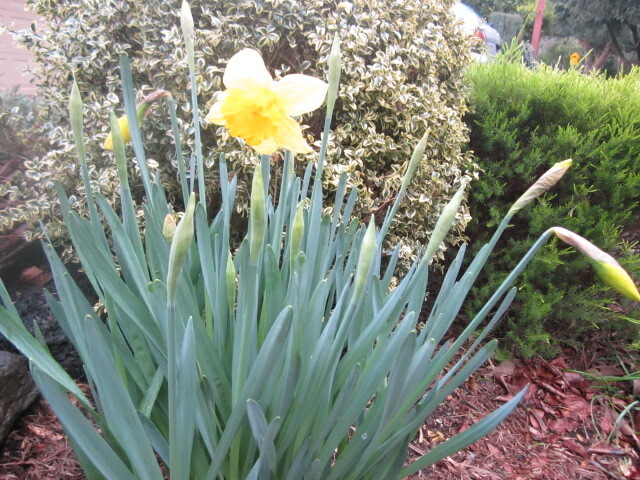 It strikes me as rather bizarre, to be telling you about a blooming daffodil in the middle of July. The seasons worldwide are definitely changing. 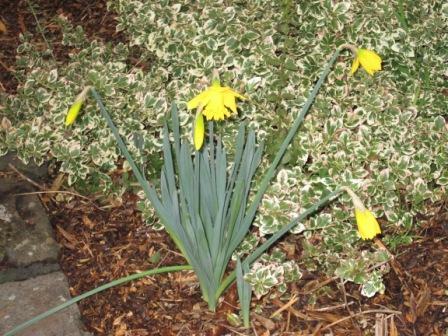 Experiencing a fairly mild winter here in Melbourne, Australia, I was amazed to find the first daffodil of the season, almost a month earlier than last year. 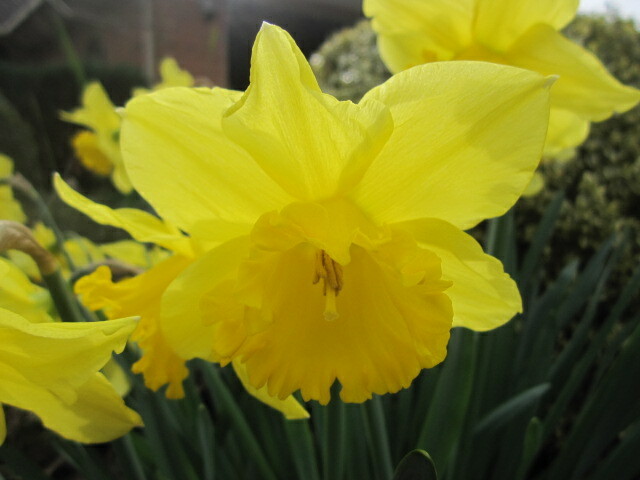 Still, I’m not complaining, as I adore daffodils. Funnily, yellow is not my favourite colour, and I can definitely trace that back to the ghastly yellow we were subjected to in our childhood bedroom, which had been a sunroom before we lived there. 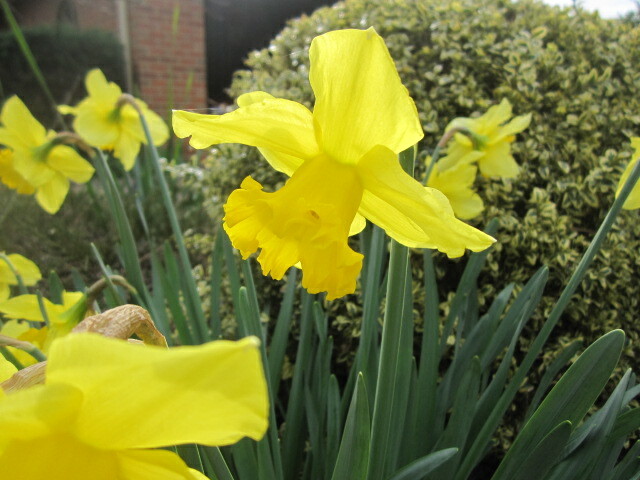 However, the sight of bright yellow daffodils is a different story. 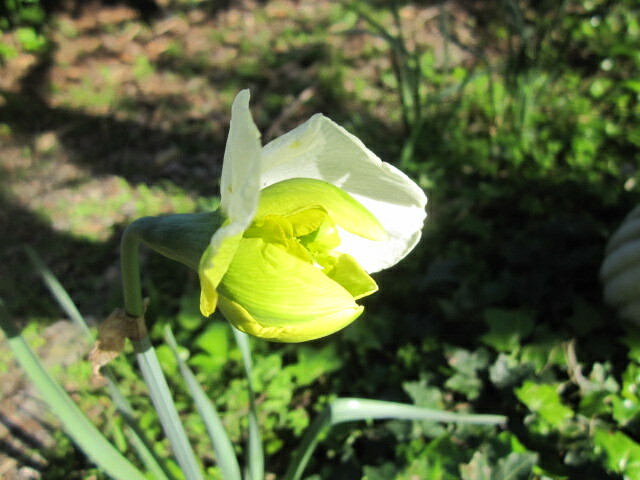 In the garden, to me they always herald the beginning of spring. 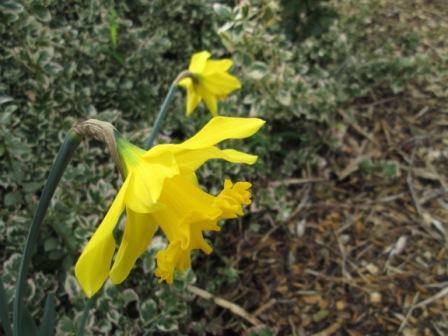 On my walk this morning I was thinking about these daffodils, when I came up with a new word. It’s bazurd, spelling of which I am unsure, because I just blended two words together unwittingly: bizarre and absurd. Isn’t that how new words are invented? The press are always doing it e.g. Brangelina for Brad Pitt and Angelina Jolie, so why can’t I? 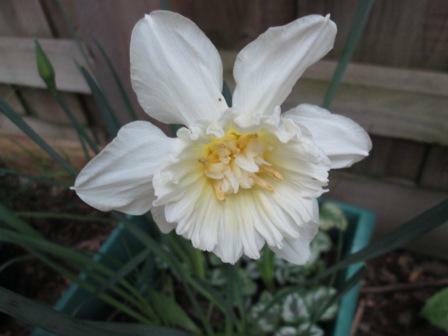 After planting out excess daffodil bulbs outside the rear bay window, and enjoying a lovely display of yellow in spring, I realised that if I planted autumn bulbs in between the daffodils, then I would get two seasons of colour from one garden bed. To this end, I took the pot of over-crowded nerines and separated them.Then I laid them out between the daffodils, the dead leaves having now been trimmed. 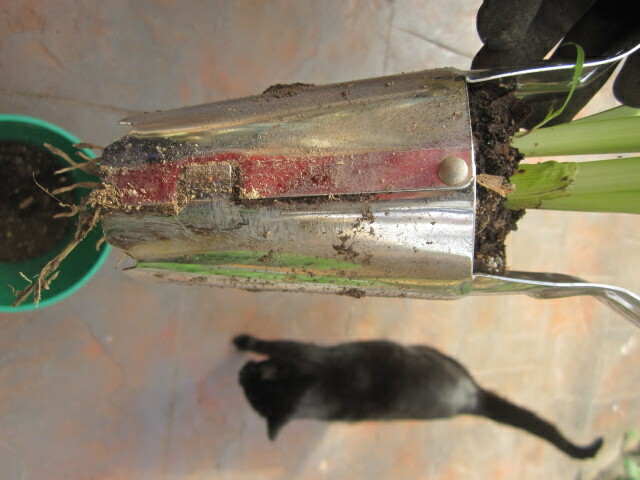 With the help of my trusty bulb remover, the task was not difficult. Shadow even helped. By helping I mean he played with a dead daffodil leaf. By the time I finished I had three pots of bulbs, plus two garden beds. That gives you an idea of how packed in they were. It was like living in a tenement and moving out to the country. Hope they survive having all that space. 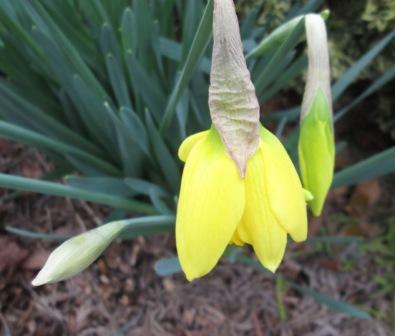 Maybe they’ll take a year or two to settle in, but bulbs are thankfully fairly resilient. Another lot of nerine bulbs are located on the other side of this path, and should create a nice mass of pink on either side. 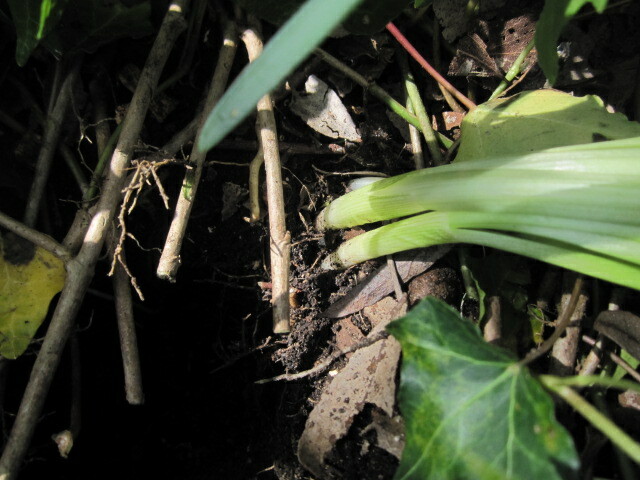 With reference to yesterday’s circle of shame, I thought I would start by rescuing the daffodils that were up there, valiantly struggling against the choking hold of the English ivy. 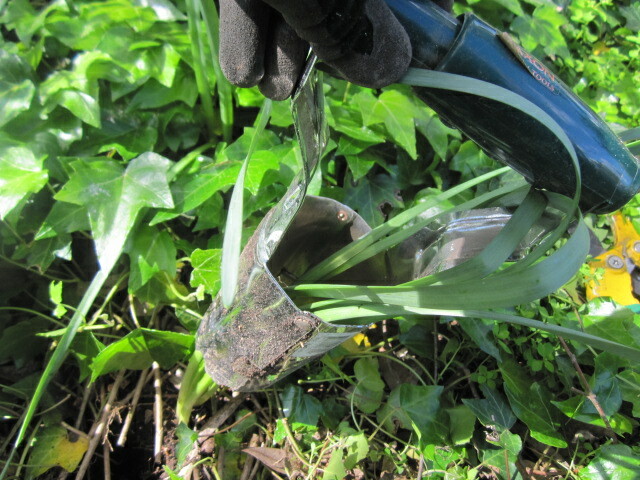 Utilising my trusty bulb remover, after I had snipped away the ivy to get to each daffodil, I threaded the daffodil leaves up through the remover and then pressed down, turning in a cutting motion as I pushed, finally releasing the bulb from the soil. I know it’s not strictly the right season to be moving bulbs, as it is generally an autumn pursuit, but sometimes if I wait for the so-called correct time, some projects would never happen. With my personality, I have to immediately harness any urge to sort or clean or attack tasks, because you never know when the next window of opportunity will arise. 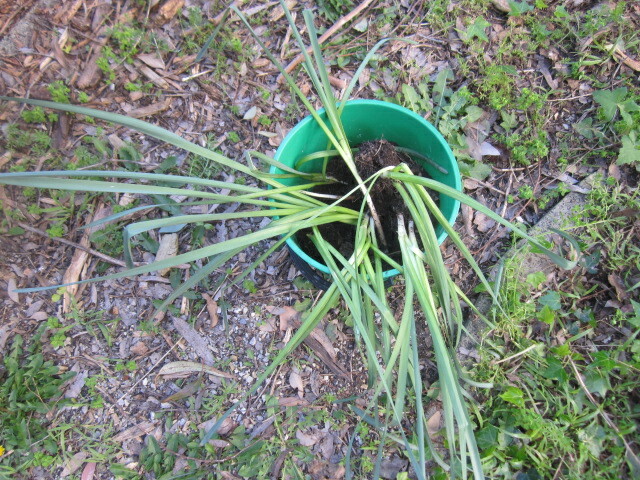 Now I have a nice bucket of rescued daffodils. I only hope I get the urge to re-plant them soon. Some years ago up in the top tier we planted a lemon tree in a circular garden, surrounded by specially selected different daffodils. Instead of the regular variety, some of them had double frills and two colours. Unfortunately they are very shaded up there due to the canopy of larger trees. However, this one managed to flower. As you can see, it seems rather unusual. Perhaps I should think about repositioning them in the garden? Elsewhere they may do better. I may have to research the net to check when is best; probably when they have died down, but then I won’t be able to see where they are. It’s not like I don’t have plenty of other projects to keep me busy. 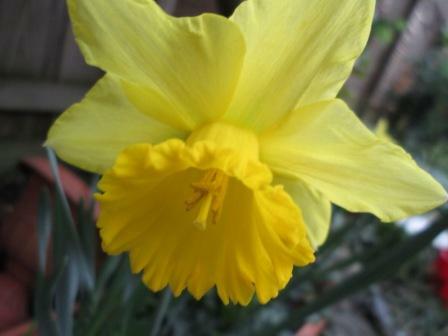 Daffy-down-dilly, which sounds a trifle bizarre, was apparently the original name for the daffodil, which belongs to the Amaryllis family, genus Narcissi, a trumpet-flowered English bulb. Being the middle of August, with all these daffodils on display, shows that spring is just around the corner. Yippee! I’m not really a winter person, but it probably makes us appreciate the warmer weather more. 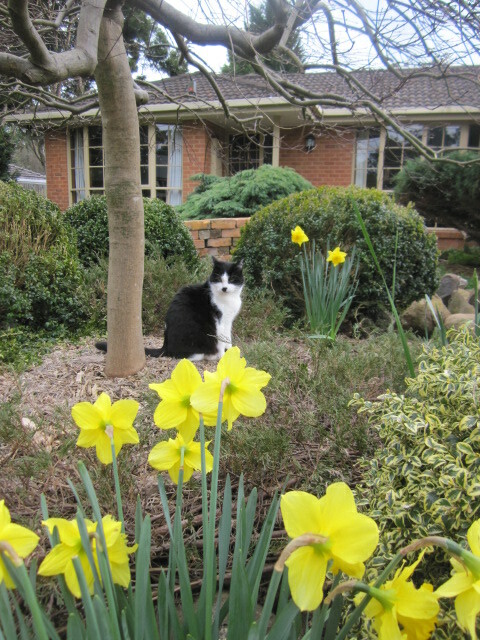 While taking these photos, Zorro deigned to pose with the daffodils to add his majestic black and white poise as a counter-balance to the delightful yellowness that is a daffodil. Let’s get back to the daffodils, which were interrupted by the arrival of Shadow on the windowsill. 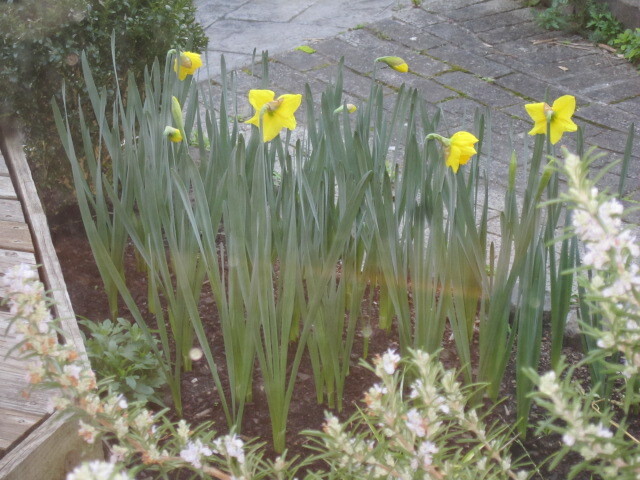 These are the bulbs I replanted from the front garden, and I love that I can see them outside the bay window at the rear of the house. 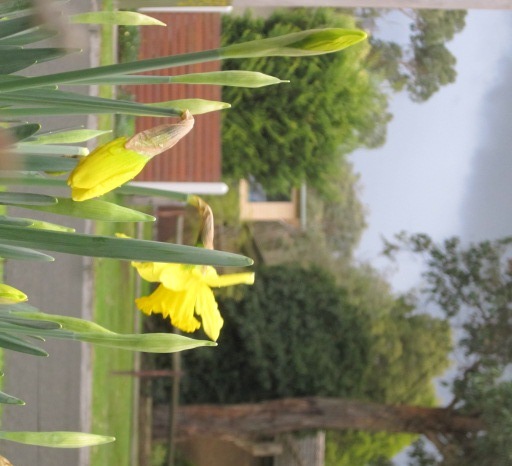 Although we are just at the tailend of July, two thirds of the way through winter in Australia, daffodils have started to bloom, bringing the promise of spring with their beautiful sunshiney blooms. On an otherwise bleak day, I was very lucky to have snapped these photos just before a downpour in which I could easily have been drenched. 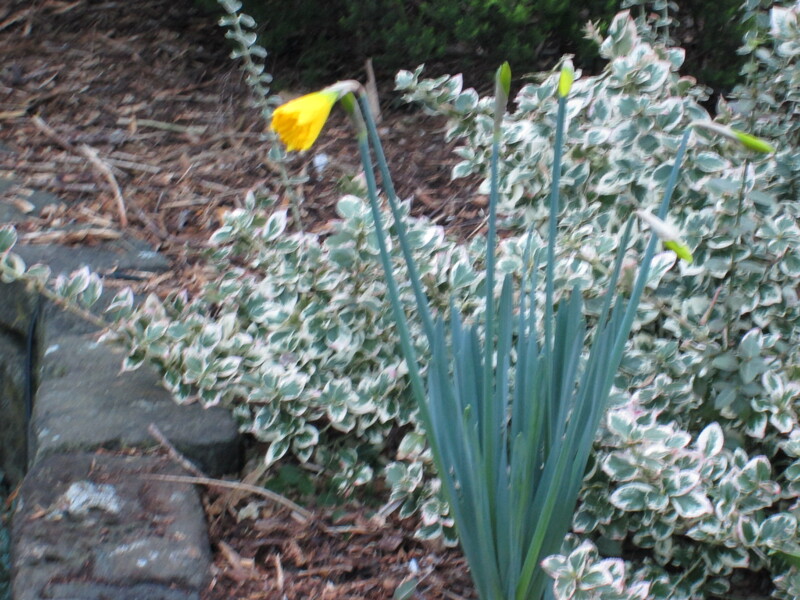 I can hardly believe my eyes: daffodils immediately after my birthday? What is happening with the seasons? My parents died in 2001, and I inherited a special blue vase that I always associate with a family tradition. Every year my father would pick the first daffodils of spring and put them in this particular vase. I vowed to carry on this ritual each year, as it is another way of honouring my parents. Much to my chagrin, I currently cannot find this vase. Evidently I have put it in a safe place, and it may or may not ever come to life. 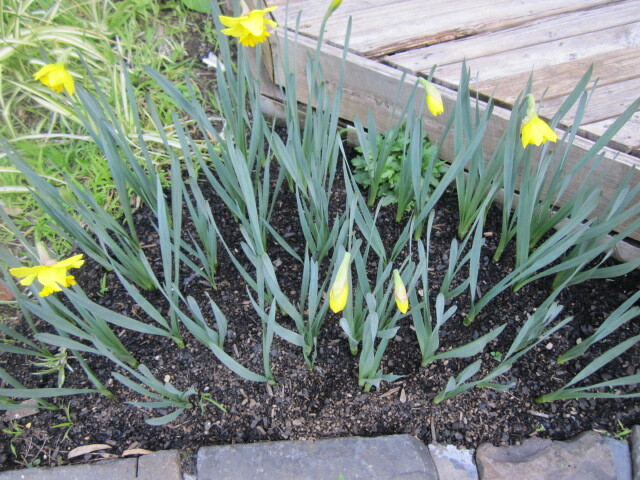 So it’s fortunate in one sense that when I spied these first daffodils, I didn’t race out and snip them immediately. 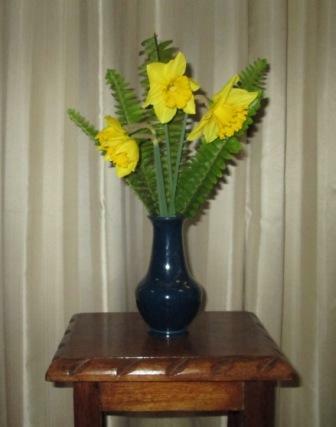 Fortunately a few years ago I took a photo of the vase, complete with daffodils. Interesting to note that it was taken at the end of August, almost two months later than this blooming lot. While the vase is hiding this year’s bulbs may as well stay out in the garden.